There have been a number of accusations made that we eat bird's eggs and fledglings, with the accusers often going further and blaming us for the declining numbers of birds. Firstly, to keep things clear, Red and Grey Squirrels both have very similar behaviour in many ways, and eating eggs and fledglings when the opportunity arises is common to both. It isn't just grey squirrels as many conservationists would happily have you believe. Unsurprisingly, no evidence has been found that we actively search for bird nests. We're predominately vegetarian, as evidenced by the majority of our diet being tree seeds, fungi, nuts and berries. However, if we're hungry and we stumble upon a birds nest, then we won't waste the opportunity. When you look deeper into the accusations that we're responsible for the decline in certain species of birds, you find there isn't any evidence on the subject and the majority of information available is opinion and conjecture. 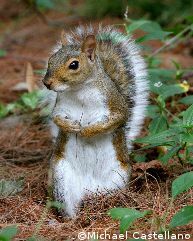 "Grey squirrels are not found in most other parts of Europe, yet woodland bird population is also dropping on the continent." "Poor woodland management, climate change and factors affecting migrating birds are far more significant." "Our results indicate that grey squirrels are very unlikely to have driven observed declines of woodland birds in recent years..."
It has been suggested by the Forestry Commission that grey squirrels can actually help bird populations in woodlands when they strip bark from trees. This encourages fungi and invertebrates, that grow in the stripped areas of bark, and this provides a good source of food for woodland birds. On the rare occasions where a tree dies because of stripped bark, if humans leave the dead wood alone, it serves as a great nesting space for birds.